Alliance contracting offers an unprecedented way to create a strong synergy between partners to deliver a project too complex for traditional ‘hard dollar’ procurement and delivery methods. It brings together several organisations including the client, such as a government infrastructure agency or utility; and non-owner participants such as a civil engineering firm and a constructor, as well as technical specialists as required. Alliance models include pure alliances and Early Contractor Involvement (ECI). An increasing number of organisations are also using a hybrid model blending traditional contracting with a collaborative approach to achieve high performance against selected Key Result Areas (KRAs) critical to overall success. 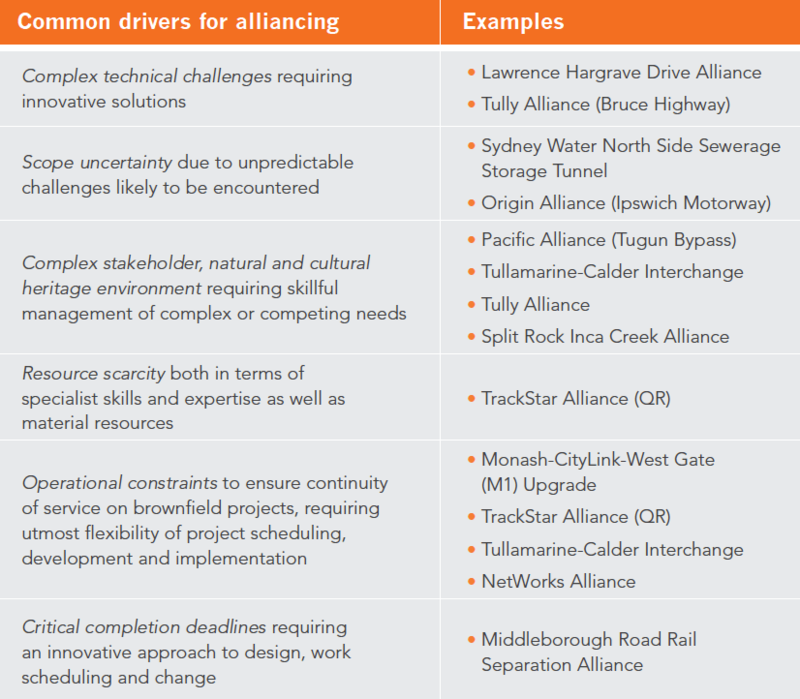 The table shown provides an overview of some of the common reasons why organisations pursue alliances, particularly for infrastructure projects. 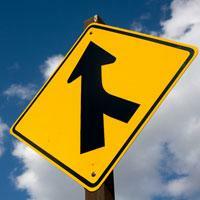 The contractual basis of alliances is well suited to achieving a quick start on projects. Alliancing gives the group flexibility to react, change and adapt to difficulties with minimum delay: 80 percent of complex projects are delivered on time and on budget or better. It also allows capacity for clients to deliver a large and critical body of work in a tight timeframe in resource-constrained markets to enhance community capability and productivity. There is a range of collaborative models to suit various projects, including competitive models where pricing elements can be introduced. Alliancing is shown to have higher productivity rates, job satisfaction and loyalty from delivering positive project outcomes, rather than protecting a legal or contractual position. Additionally, it is common for an alliance to set new benchmarks for project safety and stakeholder management, as well as introduce innovative solutions to address technically challenging projects. Overall, the success rate of Australia’s alliances provides a competitive edge to Australian leading practitioners for access to overseas markets. Select a procurement model: The procurement model selected should address the overall project needs within a value for money criteria defined in the project business case. Alliances should not be a de-facto model for large projects, but should be selected because other methods don’t fit the project’s needs. Options range from design and construct lump-sum contracts (tender based e.g. Road Construction Contract, Qld); to pure alliances including ECI; GC21 collaborative type contracts; and hybrid models, which can be defined based on the requirements and complexities of the project. Pure alliances or ECI are suitable where complexities cannot be assessed or solved ahead of project scoping. Program alliances are suitable for interrelated projects and achieve cost efficiency from project to project. They also encourage mid-tier contractor involvement. Competitive alliances or ECI may be suitable where complexities are less technical or can be partly addressed before project scoping to reduce uncertainty and risk. Alain Mignot has written 5 articles for us.